HBCU Gameday takes a look at the top HBCU football programs heading into Week Four. Hard to believe, but as I sit here and type this, the first quarter of the 2017 college football season is gone. As usual, the first couple of weeks have been filled with a few non-conference upsets (Hats off to TSU, Howard, and A&T) as well as some #CutTheCheck blowouts and the inter-NCAA Divisional Play. So with those games out of the way, for the most part, it’s time to turn our heads towards conference games which means our initial power rankings. We’ve divided them into FCS and D2. 1. Tennessee State (3-0): TSU started off with the first big win for HBCUs this season when it went down to Georgia State and came away with a 17-10 win over the FBS school. It followed that win with back-to-back victories over middle-of-the-road SWAC (Jackson State) and MEAC (Florida A&M) teams to march into OVC play perfect. 2. North Carolina A&T (3-0): After years of being a ground-and-pound team with All-World running back Tarik Cohen leading the charge, the Aggies have placed the reins of their offense in the hands of junior quarterback Lamar Raynard and are also perfect, with wins over FCS (Gardner-Webb), D2 (Mars Hill) and FBS (UNC-Charlotte). The Aggies will look to continue that success in the MEAC. 3. Grambling State (2-1): The defending HBCU National Champs came into the season highly regarded, and they’ve done everything they needed to do so far. 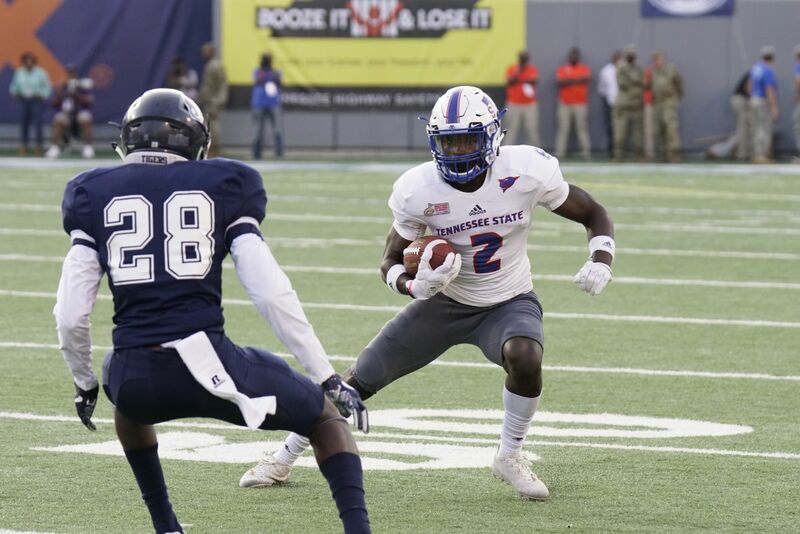 GSU wasn’t able to come up with an upset vs. Tulane, but Martez Carter and DeVante Kincade have helped the GSU offense put up nearly 30 points per game in back-to-back wins over Northwestern State and Jackson State. 4. North Carolina Central (1-1): The defending MEAC champs have the smallest body of work of anyone here, and the hardest to read. They were blown out by Duke, as expected, and blew out Shaw, as expected. We’ll know more about them on Thursday when they take on South Carolina State. 5. Howard (1-2): Howard is on a two-game losing streak, and coming off a 47-point loss to Richmond. But its historic win over UNLV and a solid showing against FBS Kent State show that it has the talent to compete with any HBCU at this point in the season. 1. Bowie State (3-0): The two-time defending CIAA North champs have opened up the season strong, with an average margin of victory of 35 points in the first quarter of the season. Two of those wins have come against programs who are a combined 0-6, but it also dominated two-time defending CIAA champ Winston-Salem State who was nationally ranked at the time. 2. Albany State (2-1): ASU opened the season with a win over traditional power Valdosta State and then dominated against SIAC power Tuskegee before suffering a 35-27 loss to a tough North Greenville squad. ASU has a tall task ahead of it this week as it takes on a West Georgia team that dominated its first two SIAC opponents by a combined score of 79-15. 3. Winston-Salem State (2-1): The two-time defending CIAA Champs have had an up-and-down start to the season thanks to a tough schedule that has included two teams that have appeared in the D2 top 25 (UNC-Pembroke and Bowie State) as well as a scrappy Virginia Union team on the road. Things don’t get any easier in Week Four as it has to take on Virginia State. 4. Tuskegee (2-1): Like WSSU, Skegee has had an up-and-down start and consistency issues on offense. It does have a win over FCS rival Alabama State on its resume and took care of business vs. Clark Atlanta. Once its offense rounds into shape, look out. 5. Virginia State (2-0): VSU is coming off a rare bye week in Division II football as it prepares to take on WSSU on Saturday. VSU survived self-inflicted wounds of turnovers and penalties to beat FCS rival Norfolk State in its opener and then came back to pound Johnson C. Smith in Week Two. As long as VSU is armed with Trent Cannon they are must-see HBCU football. Alcorn should’ve been mention in this Ranking, but we will see at the end of the season who is who.